The Agarose gel electrophoresis technique, as the initial screening procedure, is a very reliable technique to detect paraproteins in blood serum and in other biological fluids. It is a clinical significant method to detect serum protein changes associated with certain diseases. Changes from normal serum protein patterns, either as the presence of extra components (monoclonal bands), or as an increase/dicrease of normal occurring components, alerts the clinician to perform further protein analysis. The Agarose gel electrophoresis roughly measures the various types of proteins in the serum portion of a blood sample. Individual proteins, with the exception of albumin are not usually measured by electrophoresis. However, protein fractions or groups are measured. 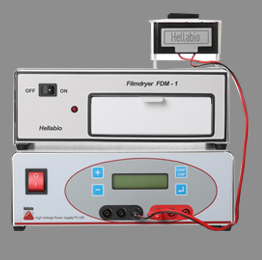 The levels of protein fractions can be roughly measured by measuring the total serum protein and multiplying by the relative percentage of each component protein fraction, or automatically by HellabioScan Gel Analyzer.